I wasn't able to attend last Thursday's SBC Public Information Session but was obtain and post the slides from the meeting on the SBC website. There are a couple of slides from this presentation that I hadn't seen before and are worth sharing. and a ground level view of the front entrance of the new high school. The latest project budget information was also presented at this public forum. Below is the slide from the presentation. For those town residents who want to learn more about the school building project, I invite you to visit the SBC website and to continue visiting the LongmeadowBuzz blog. This week’s Select Board discussion on the FY11 budget provided some good insight into the current “state of town finances”. However, what I observed was not very encouraging. The uncertainty about the level of local state aid makes this current budget development process very difficult. The current budget proposal assumes a 15% drop in state aid. There was some discussion at this meeting as to whether or not this number should be reduced since the rhetoric from Boston in this election year suggests that the state will deliver. Below are two short video excerpts (less than 10 min. each) from this meeting that are worth watching. The first is an overview of the town government portion of the FY11 draft budget discussed by Town Manager Robin Crosbie. It should be noted that a final budget will not be adopted by the Select Board until March 22. Ms. Crosbie highlighted that town expenditures were being reduced through various means including a reduction of normal maintenance work (essential repairs only), a cut in library hours (50 hours to 45 hours), less maintenance of athletic fields (+ reduced fertilizer, water, etc…). In addition, there are headcount reductions at the library and DPW. Ms. Crosbie did mention that she was hoping that Carl Sturgis, Library Director would be able to restore library hours to 50 hours by shifting some other sections of the budget. The second clip includes comments by Select Board members Rob Aseltine and Mark Gold highlighting that the town budget at the level of current services is unsustainable due to the faster growth of expenditures relative to revenue. In addition, the level of expenditures for the current budget is too high. The choices are either continuing cuts in services that will erode our quality of life in many ways or accepting the need for periodic overrides to keep pace with the escalating costs and lower revenue growth. There is a budget forum that will be held on March 9 at 7 PM in the Longmeadow HS cafeteria. I urge all town residents to attend or watch it on LCTV. The FY11 budget is an important issue affecting all Longmeadow residents. The culture and community of Longmeadow is based on a foundation of learning. We pride ourselves in our School System. It serves 3,100 children. For this system the town budgeted to spend 74% of town revenues this year, or $34,500,000, for schools. Our Storrs Library also is one of our prides. The Library serves all 16,000 of us. This year our town budgeted 1.8% of revenues, or $838,000, for our Library; this amount is one fortieth of what we spend on the schools. For next fiscal year, your town government is looking to reduce library hours to below the minimum required by State government to obtain their financial support. Should library hours be cut to below 50 per week, Storrs Library will be decertified by the state. WHAT LONGMEADOW LIBRARY WILL LOSE IF DECERTIFIED ! Timely and convenient access to current newspapers, periodicals, books, DVDs and audio. Town government must budget next year what is needed to keep our Storrs Library doors open and functioning well 50 hours per week. Your Select Board meets next Monday, March 1 and on March 8 to continue their discussion of library funding for next year. The final actual cost of the Longmeadow High School project is probably three years away at best- once the mortar sets, the paint has dried and the classrooms are filled with students. What will be known in the very near future is the state’s agreed upon portion of the debt and the Town’s share. The appropriation of the Town’s share of the debt is controlled by Town Meeting which is scheduled for vote at the May 25, 2010 Special Town Meeting. The vote at Town meeting will be contingent upon a successful June 8, 2010 debt exclusion ballot vote authorizing the borrowing of the Town’s share of the debt. 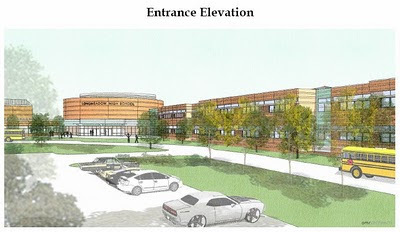 Current estimates for the new structure and renovation portion of the High School are approximately $78.5 million. The more important number to the Longmeadow taxpayer is the Town’s share of the project. This amount is currently estimated at $46.6 million dollars and is subject to change based on the MSBA (Massachusetts School Building Authority) Project and Scope meeting currently scheduled for March 31st. 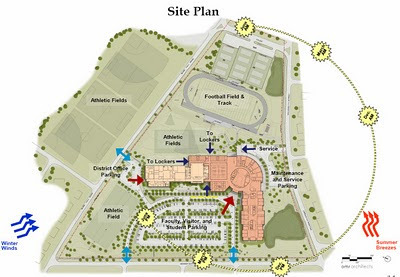 Upon MSBA approval of Project Scope and Budget, the Town will only have 120 days to successfully fund the Town’s share. 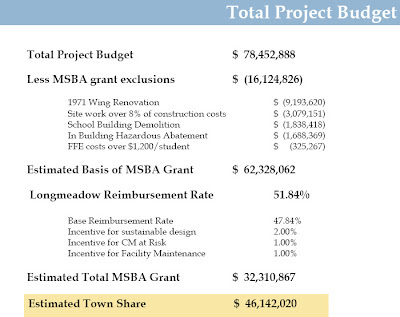 Under the MSBA’s current project financing methodology, the Town will progressively receive the MSBA’s share of the project which eliminates the need for the Town to borrow the full project cost. The Town will only have to borrow its share of the total cost which will save the Town hundreds of thousands of dollars in interest costs. How will the $46.6 million be financed and how will it affect the individual taxpayer? An example of one financing option uses equal principal payments over a 25 year bond life at a 3.5% interest rate. Currently, the average assessed home value in Longmeadow is $350,000 which equates to an average increase in taxes of approximately $455 per year over the life of the debt (see Chart A below for tax increases for each year). A 5% interest rate would average a tax increase of $516 per year for a $350,000 assessed home (see Chart B below). These are only examples. Several different financing options are currently being reviewed in order to minimize the tax impact. Some areas of consideration include: supplemental grant funds availability; conventional tax exempt bonding versus other bonding options available; timing of permanent bonding; consideration of phasing the borrowing to take advantage of current low rates; and, the overall town debt schedule. It is our goal to minimize the tax impact to all residents by leveraging the best financing and grant options available.